I always thought they grew on trees…like coconuts. Saturday we took a long drive around the island. We started off from Waikiki, which is on the southern side, and we drove all along the east and north coasts. We stopped at Kailua beach. Beautiful. We stopped at Haleiwa for an avocado burger. Amazing. Everywhere you look is just so breathtaking. Can’t even describe it in words here. Just get here and see it yourself. Do it. 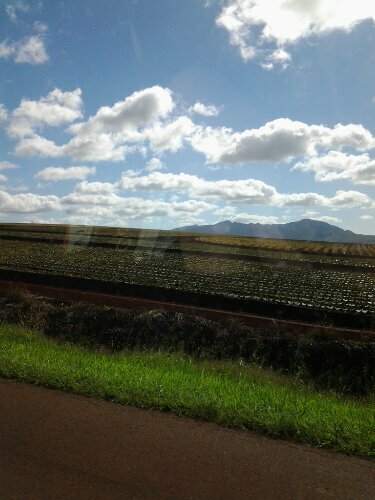 But on the way back, we passed all these pineapple fields and coffee fields. It was pretty cool. We also passed the very pineapple tourist trap that I wanted to visit the other day. We didn’t stop. I figured seeing actual pineapples growing from the earth was good enough for me…even if their future lies in a taste-sucking aluminum can. Shame. I am learning stuff now. So they don’t grow on trees? That is just crazy. I hope they wash them off. I know! I felt like everything I thought I knew about pineapples was shattered! So are they a fruit or a root or or a tuber or what? When will the madness end? Next I suppose you will be telling me that coconuts do not grow under the ground? I just got a pineapple from the store today~ I must be subconsciously wishing I was in Hawaii with you! What was on the avocado burger? i had no idea! i feel like your messing with me. it just seems wrong. they must grow on trees!